Black Hills Gold Cross Earrings by Black Hills Gold Jewelry at Blood of The Young. MPN: G374. Hurry! Limited time offer. Offer valid only while supplies last. Gold Cross Earrings with 12k pink-gold and 12k green-gold leaves on 10k gold cross base. These Cross Earrings have 14k gold post with friction nut. 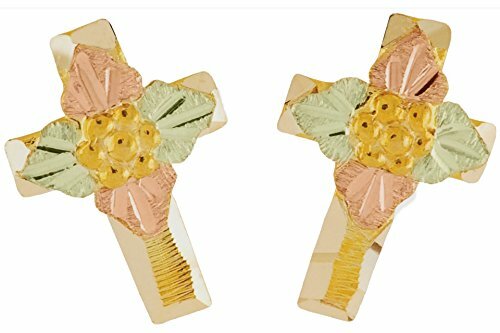 Gold Cross Earrings with 12k pink-gold and 12k green-gold leaves on 10k gold cross base. These Cross Earrings have 14k gold post with friction nut. Earring measures 1/4" x 3/8" inch. Ships 2 to 3 business days. If you have any questions about this product by Black Hills Gold Jewelry, contact us by completing and submitting the form below. If you are looking for a specif part number, please include it with your message.